Big projects require tools that are up to the task, and that’s exactly what you can expect from Campbell Hausfeld. 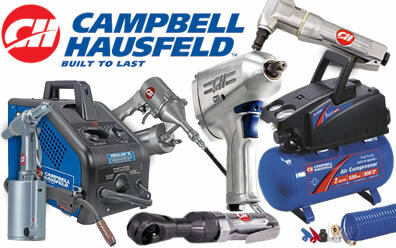 From its beginnings in 1836 as an agricultural equipment manufacturer, Campbell Hausfeld has developed a reputation for manufacturing hard working tools that are built to last. More than 150 years later, its reputation for professional-quality tools and shop equipment remains, including powerful air tools and compressors, time saving power tools, and portable welders. No matter what the job is, Campbell Hausfeld will help you work fast and efficiently, and Summit Racing will keep you within budget! The part CAM-TF2111 has an additional shipping charge of $9.99 per item due to its large size and/or weight.